This is my first ever Daring Bakers challenge*. I was very pleased to learn it was a Flourless Chocolate cake. I had planned on making a molten lava cake when I learned that this months challenge was this cake. Needless to say I was very pleased! Now people, I love chocolate…so I was really excited to try this recipe. My sister and I used to go to Trader Joes and gawk at the flourless chocolate cake but for some reason we just never bought it ( I think we were on a diet). Eventhough I had a month to make this cake, I had to do it within the first week because I was going on a 2 week caribbean getaway. This cake is very simple to make and very good. Its a chocoholic’s fantasy. I used milk chocolate and spiced it up with a bit of chili powder. I must say I was pleased with the results. It was a silky, decadant texture…very moist and rich, I was in heaven!! 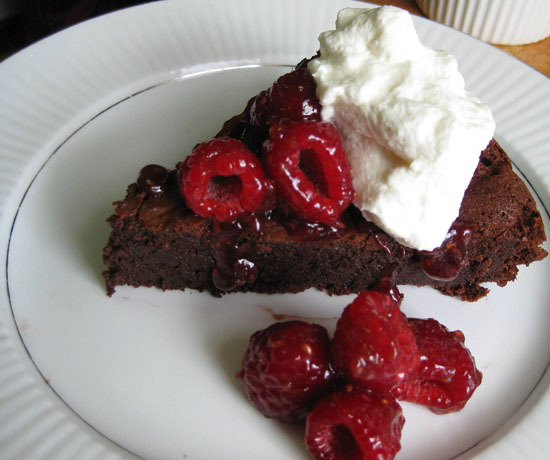 It was served with sweetened whipped cream, a simple raspberry sauce and fresh raspberries…a classic and perfect combination. For the raspberry sauce I simply melted raspberry preserves in the microwave. I allowed it to cool and coated the raspberry with some of the sauce. Take the extra time to make the whipped cream from scratch, it is so worth it and taste alot better than the canned stuff. All of you chocoholics out there enjoy…this cake will also be awesome with vanilla ice cream. 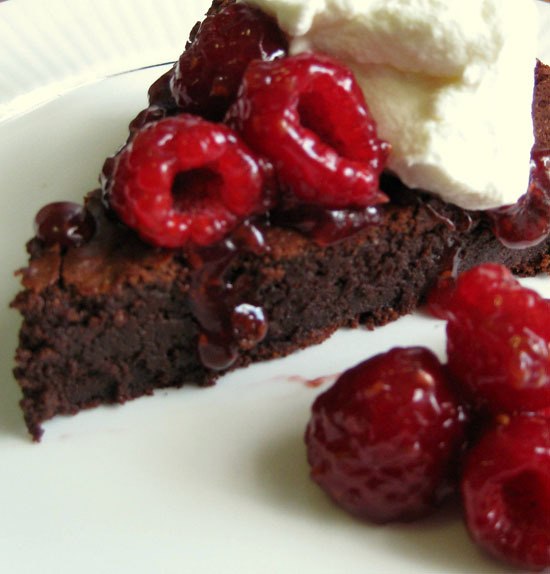 This recipe is adapted from Sweet Treats by Chef Wan. 6. Add the egg yolks, chili powder and vanilla to the cooled chocolate. Mix all ingredients together and whip to a stiff peak. Make sure not to over mix!! *The February 2009 challenge is hosted by Wendy of WMPE’s blog and Dharm of Dad ~ Baker & Chef. Previous Post Valentine’s Day without Chocolate? Your cake looks great! Adding chilli was a clever idea. Welcome to the DB’s! Yes, I think that would absolutely kill me. Though I want to eat it anyways. This picture is sooo drool-worthy! Thanks for sharing! Yum! This is AMAZING! My mom just made this for me to atone for her eating up my TJ’s choc cake in her freezer (there’s no TJ’s here). This is SO much better! Dangerously good. Thanks for posting. You’re welcome Reesa. This is indeed death by chocolate, it is beyond decadent!